The purpose of the wordcloud is to give a visual impression of the range of texts used (either direct quotations or allusions) by Paul and their frequency of use. Letter sizing relates to the frequency of which each book has been used. A couple of points need to be made concerning this wordcloud. For the most part, the calculations have been made using the list in NA27 (appendix IV). Identifying allusions is particularly difficult and Kierspel’s Charts on the Life, Letters and Theology of Paul has also been used as a rough guide. Scholars differ about which letters should be included in the ‘genuine’ Pauline corpus. In other words, which letters have been actually written by Paul. For ease of use, and also to reflect the approach used within the module, this wordcloud excludes the Pastoral Letters (1 Timothy, 2 Timothy and Titus) from the corpus, but includes the ‘disputed’ letters. 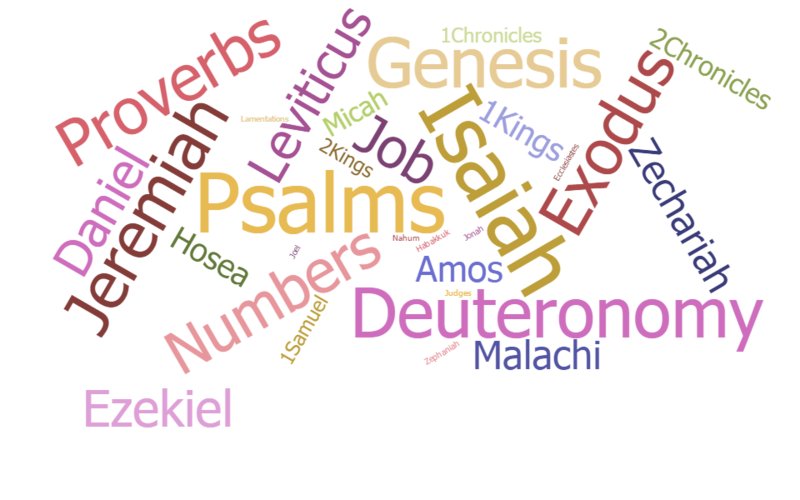 By my calculations, Paul refers to Isaiah 74 times, just beating 73 references to the Psalms, and is therefore the ‘winner.’ It must be noted that Kierspel (although he also includes the Pastorals) states that Psalms is Paul’s most widely cited (direct quotes and allusions), followed by Isaiah. The prominence of Isaiah, particularly Deutero-Isaiah (Isaiah 40-55), in Paul’s writing is not particularly surprising, given its emphasis on Israel and the work of God in relation to the nations around. There are quite a few books which are only referred to once. Among these are: Jonah, Judges and Joel. These are displayed as the smallest. Paul’s use of Deuteronomy is reflected here (34 times). The place of Deuteronomy in Paul’s thought (and NT Wright’s interpretation of it) was addressed in greater detail in Steve Moyise’s seminar earlier this year: Wright on Paul’s use of the Scripture. Among the omissions from the list, perhaps, the most suggestive, is the lack of reference to Ezra-Nehemiah. Although, in the light of its exclusivist (some might argue, xenophobic) attitude towards its non-Jewish neighbours, its omission might not be that surprising! One of the problems with wordclouds is that it is very easy to jump to all sorts of (wrong) conclusions. Books missing from the cloud must not be taken to indicate that Paul did not know them or disagreed with them. Similarly, texts that are frequently quoted should not be viewed as being invested with higher significance for Paul. Paul selects and uses texts which he feels are relevant and will help him to substantiate a claim or explain/develop an argument – although it is true that, sometimes, he does use texts in rather unexpected ways! Neatness from the English Church of England Anglican Church Professor Goode.